Activity Fee: There is a non-refundable activity fee of $375 to join the team. Please note: Because we are club and not part of the school district’s athletic department we receive no financial or in-kind support from the school district. As a result, the team depends on activity fees, fund raising and donations to cover it’s expenses. 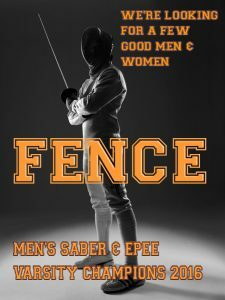 The team is operated by the LHS-VHHS Fencing Foundation, Inc., an Illinois non-profit organization so all fees are used exclusively to support the team. If you want to compete in tournaments you will need to buy your own gear. The total cost for everything you’ll need to be fully equipped is approximately $300 for epee and $400 for foil and sabre gear after our club discount. Fencing equipment is not cheap, but it’s a lot less expensive than hockey or football equipment! Our team has a vendor come to our practice to allow you to try on and purchase equipment. If you can not afford equipment, please don’t let that affect your decision to join the team. The team has a some loaner gear and LHS and VHHS have special programs to help support athletic participation for families with limited resources.